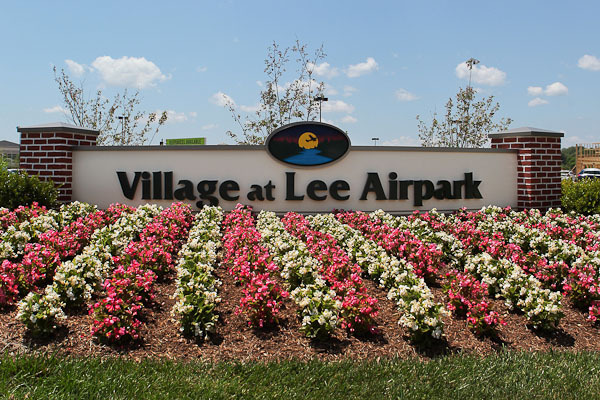 E-Landscape Specialty Solutions, LLC.The Village at Lee Airpark - E-Landscape Specialty Solutions, LLC. The Village at Lee Airpark is a 200,000 square foot shopping center that represents the culmination of a decade-long effort to redevelop a busy, mixed use corridor along Maryland’s Route 2. A new, 63,000 square foot Giant anchors the property, which also features a Panera Bread, Hong Kong Express, Subway, Chipotle, Hair Cuttery, GNC Nutrition Center, and a day spa. The project was marked between unprecedented cooperation between property owner, developer, and local residents, and utilizes several cutting-edge environmental techniques, especially for stormwater control. E-Landscape expanded upon the initial landscape design with the objective of beautifying the property and enhancing its environmental sustainability. Notable features of the property include a parking lot featuring infiltration swales and retention ponds that will help to prevent stormwater from flowing into the three nearby tributaries of the Chesapeake Bay. In addition to contributing to the landscape design, E-Landscape ensured that the final plantings were carried out in time for the grand opening. The result is an attractive shopping center that is also “the greenest project” that Regency Centers, the developer, has ever completed. Since completing work on the landscape installation, E-Landscape has also been contracted to provide ongoing landcare services for the Village and Lee Airpark. Landscape design and planting for the opening of The Village at Lee Airpark in Edgewater, Maryland. Copyright © 2019 E-Landscape Specialty Solutions, LLC.. All Rights Reserved.